Every life matters, especially to the one experiencing it. Little Darla was found covered in ice and snow in the centre median of a busy road. She had been hit and would have become another fatal raccoon statistic had she not been rescued by 4 compassionate passers-by's. How can we justify that we are not the cause of these traumas? We build highways without consideration of the safety for our wild ones. We need to take responsibility for our actions. Our encroachment into their natural habitat, their homes, is never-ending. We more often than not, think only of ourselves, and "Let nature take its course". I often wonder what is so natural about injured wildlife. 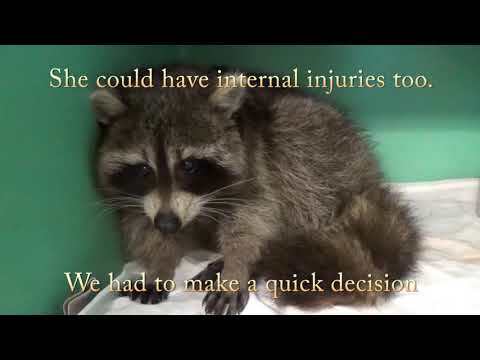 The majority of the animals we see in wildlife rehab have been hurt, directly or indirectly, by unnatural events, particularly human activity and their pets. No blame intended, just truthful awareness. When we come to the realization that like us, they too want to live and that their life is just as important to them as our life is to us, that is when we as humans have to fix the wrongs we created and make it all right again.